We partnered with Alaska Seafood for tips on how to grill fish like halibut and salmon all year round. 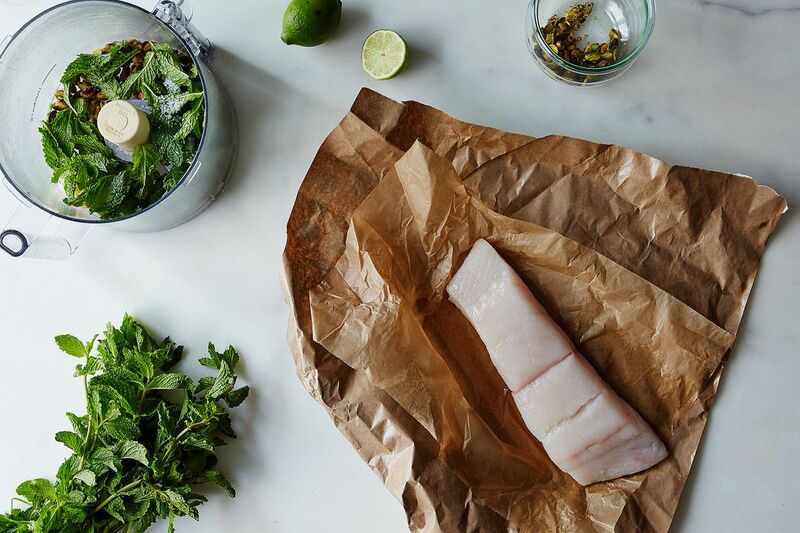 There are two schools of thought regarding how to grill fish consistently well: Either pick the right gadget or pick the right fish. 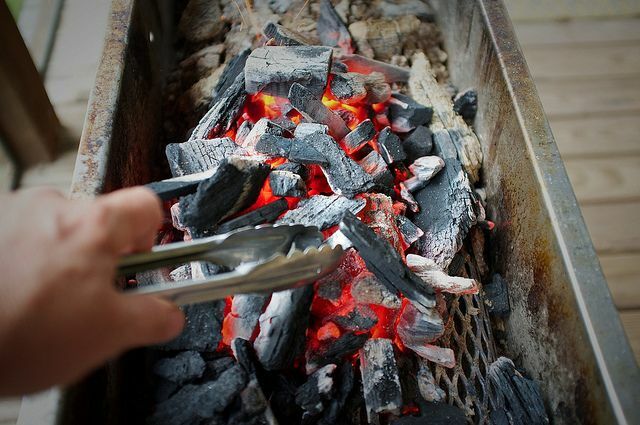 You can employ a fish basket to grill a whole fish, use a cedar plank to cook one over an open flame, or use steel tongs to keep a flaky white fillet from falling into the charcoal. Or you can pick a fish that’s built like a steak. Each fish steak you are planning to cook should weight about six ounces, be at least a solid inch thick, and kept very cold. Remove the steaks from the refrigerator just before you are ready to grill and pat them dry. Dampen a wad of paper towels with canola or grapeseed oil liberally. Grab the oiled towels with a pair of tongs, and rub them along the grates of the grill. Reduce the heat to medium high and place the fish on the grill, skin-side up (there may be no skin on your fish steaks, but I am referring to the side that used to have the skin on). After about 2 minutes, the lower half of the fish steak closest to the heat will start to turn opaque. That’s when you know it’s time to flip. Use a spatula (one that is wide and has a tapered edge) to gently loosen the underside of the fish steak from the grill and flip quickly. Cook for another 2 to 4 minutes, depending on the thickness of the fish. To test if the steak is done, gently use a spatula to pry open the middle contours of the fish. If they are opaque, you’re good to go. I have my biases, of course. 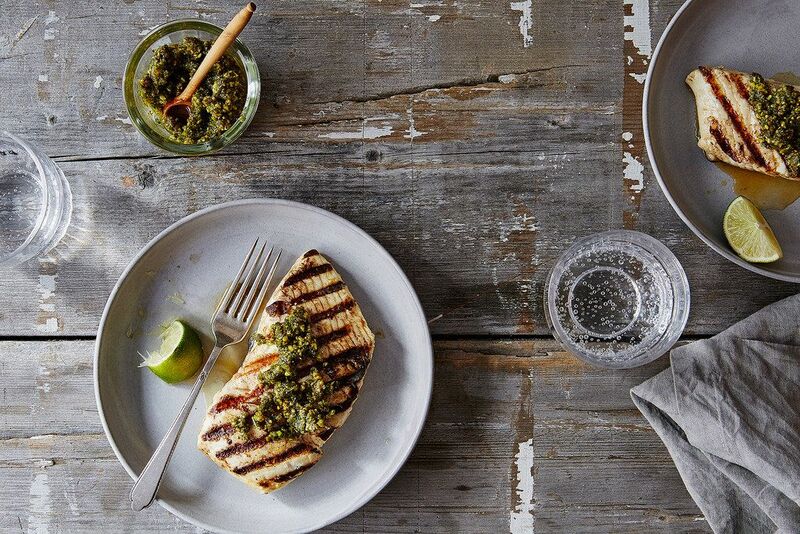 Loosen Em-i-lis’s Mint-Pistachio Pesto with just a bit more olive oil than the recipe calls for, and it will make a piece of grilled halibut seem Mediterranean even though it doesn’t swim there. The ingredients in hardlikearmor’s Green Harissa make a versatile topping. 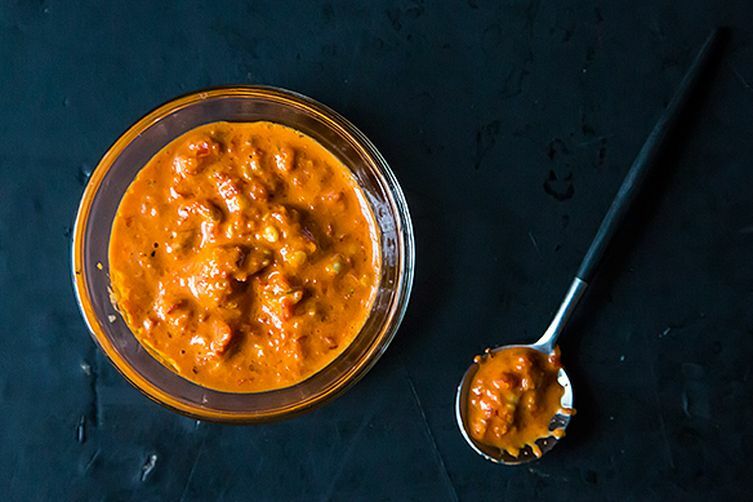 Genius Recipes Torrisi’s Spicy Sauce stands up to a fish with strong flavor. And the roasted red peppers in Jean Anderson's Sweet Red Pepper Paste (Massa de Pimentão) by Genius Recipes complements the inherent sweetness of grilled salmon. Alaska Seafood can be prepared using a range of techniques from smoking and grilling to roasting, sautéing, baking, or poaching. Try using this selection of recipes—and head here for additional ideas and cooking tips. I am an excellent eater (I have been all my life). I’m a pretty good cook (Ask my kids!). And my passable writing improves with alcohol (whether it's the writer or the reader that needs to drink varies by sentence.). I just published my first cookbook, Green Plate Special, which focuses on delicious recipes that help every day cooks eat more sustainably. Yes!!! Salsa's are so adaptable to what you can find in your area. I used to love fish and stone fruit salsas when we lived in Central PA because of all the great fruit that grows there. We're still in the herbs and greens part of the growing season up here, but tomato salsas (and ground cherry ones!) will abound later this summer.